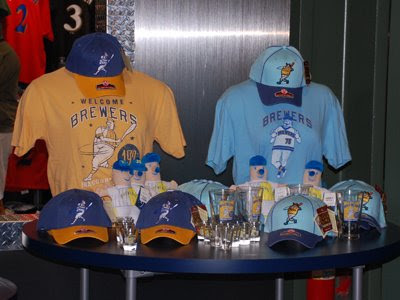 I hadn't heard about them actually hitting Miller Park shelves until today. 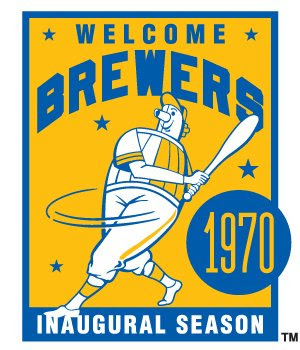 This "Welcome Brewers" logo, while made to look as though from the 1970 inaugural season, was actually created in the 1990s by MLB Properties for inclusion in the Cooperstown Collection line. MLB worked up a whole bunch of throwback logos for the various clubs. The same logo appears on the shot and pint glasses. 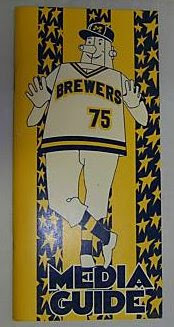 I like the 1970s Beer Barrel Man cap, even if I'm not wild about the gold bill. And the stuffed Men are pretty cute. The second cap is definitely the same c. 1970 water transfer Flex-Cote decal we've seen before. 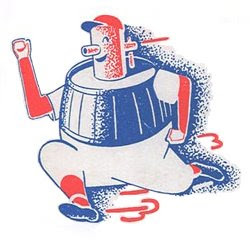 The blue t-shirt is a women's cut, and it features a variant of the Beer Barrel Man which was featured on the cover of the team's 1975 Media Guide (hence the uniform number). For what it's worth, the caps seem to be the only items currently available in the Brewers' online shop. But that can change - I know the gold t-shirt was up there earlier in the season. So, on the whole, my reaction? Something of a mixed bag. 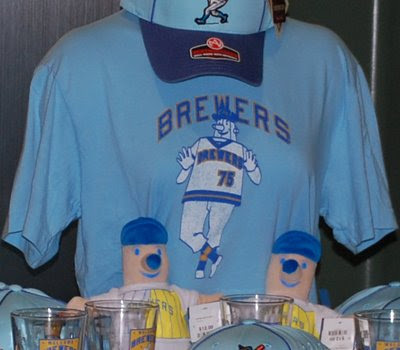 I wish there was more focus on the Beer Barrel Man himself, aside from the "Welcome Brewers" dressing. 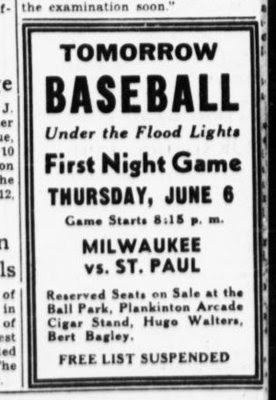 But I'm so glad the Brewers are finally recognizing this long-neglected chapter in their history (and Milwaukee baseball history in general), I don't really mind. Now it's our turn. 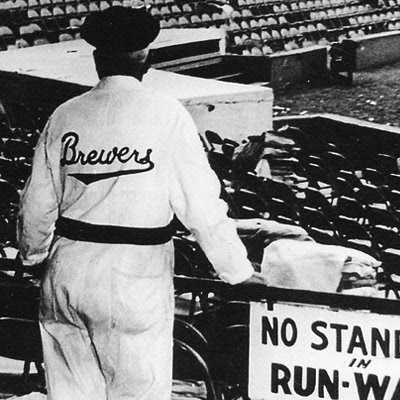 If you're also glad that he's getting a shout out in the land of the Ball and Glove, let the Brewers know. Perhaps even buy an item or two. 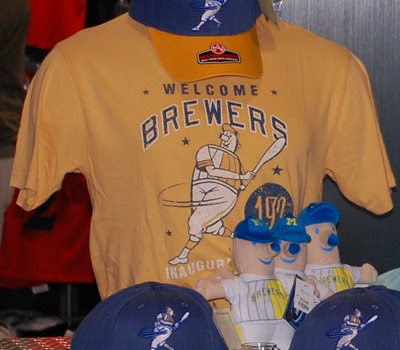 That might be the only way we can get the National League outfit to recognize the legacy of the American Association Brewers in any form. 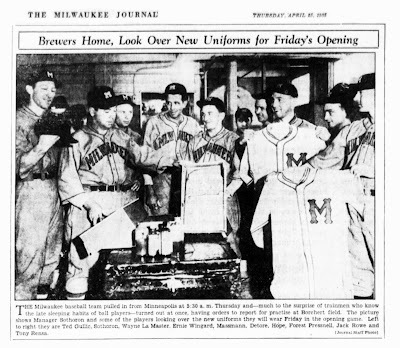 In this Milwaukee Journal photo from April 25, 1935, the Brewers inspect their new home uniforms, delivered just in time for Opening Day. 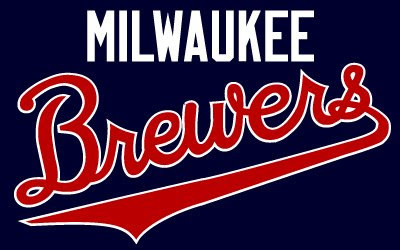 I rather like the stylized M logo, matching the "MILWAUKEE" wordmark from the team's road jerseys. And is that a new cap Gullic is holding? Perhaps with a matching M? I'll see if I can dig up some more photos. 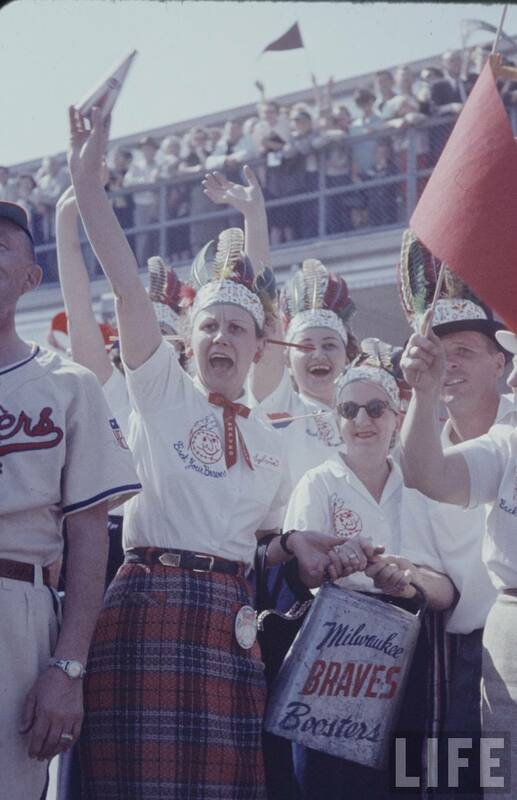 Sadly, this stylish new home uniform was to be short-lived; by the 1936 season, when Sothoron's boys brought the American Association pennant back to Milwaukee, the Brewers were wearing a block M over their hearts. The Brews would then stay with the block monogram until adopting a script wordmark for their jerseys in the late 1940s. So why ditch the new jerseys? 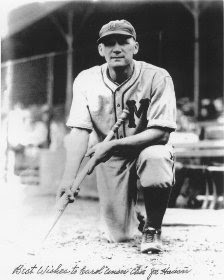 I don't know when the Millers adopted their version of the "M" logo - reliable information on the Millers information isn't any easier to find than that of the Brewers - but it was no later than 1932. 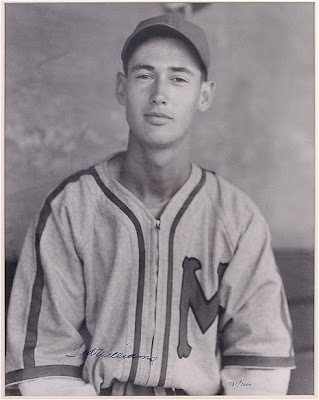 The "M" isn't exact, but it's pretty darn close to the Brewers' 1935 duds. The logo had changed a bit in the intervening years. 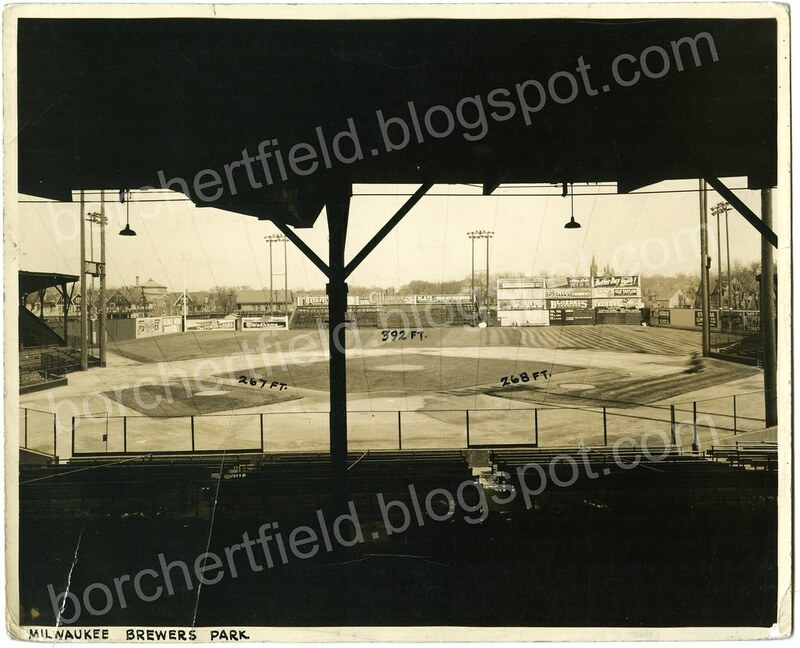 That's not quite the same as our 1935 Brewers' initial - the diagonal lines are thicker, and the verticals are missing the inside spur. So, was that it? Did the Brews decide that their fancy new jerseys made them look more like Minnesotans than Wisconsinites? Again, more research is needed. The LIFE Magazine photo archive on Google once again reveals new treasures. You have to get creative with the search terms, though. Every new search term you add yields an entirely different set of results. 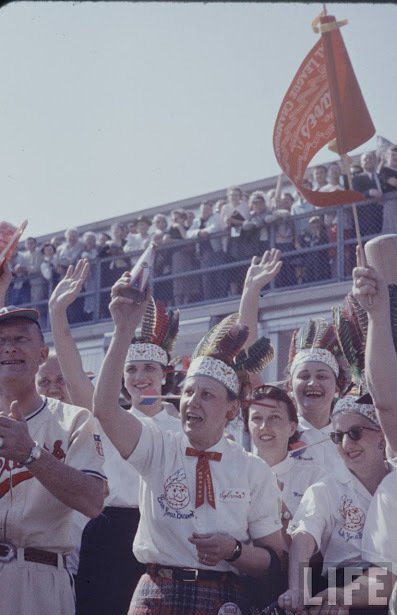 Under a search for "world series braves" we find this series of photos of the 1957 World Championship parade down Wisconsin Avenue. Does that group look like they know how to party, or what? Hilda's got her cowbell at the ready. Unfortunately, there aren't any better photos of our mystery man, at least none yet posted. 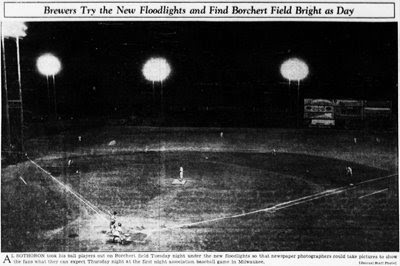 The photographer, Yale Joel, doesn't appear to have been particularly interested in him beyond his proximity to the Braves Boosters. While we don't get a good look at him, we do know a little bit about his jersey. 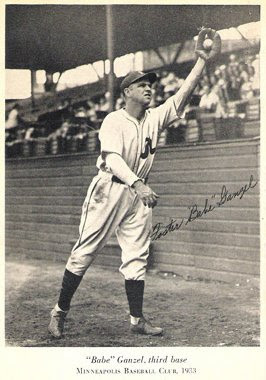 The patriotic "HEALTH" patch was worn on all major league jerseys in 1942 before being replaced by a stars-and-stripes shield. The American Association also wore the patch, and so far as I know, dropped it at the same time. The zip-front jersey with sleeve and neck piping would have been worn that year. Hat tip once again to Hat tip to Lance Smith for continuing to teach me how to navigate the nigh-impenetrable archive. I can't help but wonder what other old Brews items are hidden out there, obscured by Google's poor search tagging. 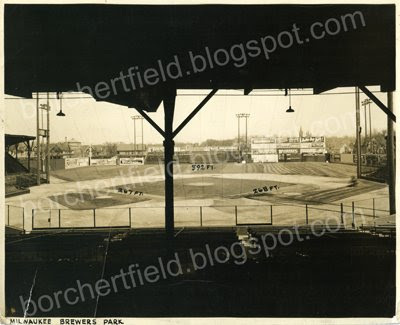 I got the new Ebbets Field Flannels catalogue in the mail yesterday (yes, I know, I'm terribly retro that way). You can see their Grounds Crew Jackets on the website. These garments are practical as they are affordable, and best of all, can be ordered in almost any team we make a jersey for! That tears it - I'm going to get a Brews jacket. I love the style, and $79 is pretty good. Okay. So that's the back. But what about the front? The Brewers never had a really identifying cap logo, so I'd have to go with something like Owgust. 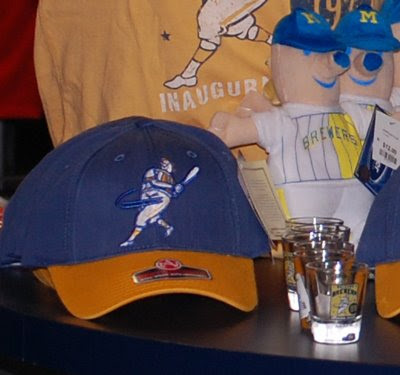 The "running" version the Brews wore on team jackets in the 1940s. So whad'ya say? Anybody with me? 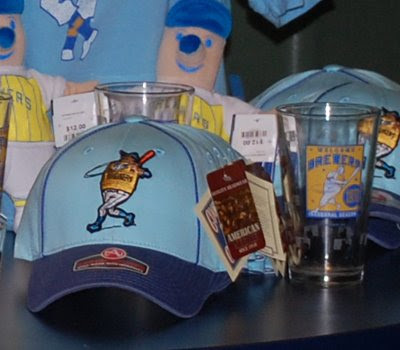 The more interest in Brews merchandise we show, the more stuff Ebbets Field will make.